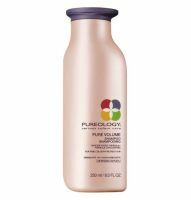 I purchased this shampoo from Pureology because I was looking for a volumizing shampoo that was suitable for color treated hair. I had used the original moisturizing shampoo from this range a few years back and loved the rich smell and density of the product. While I love that this shampoo lathers well in my fine (and often oily) hair, the smell left much to be desired, especially for Pureology....read more It smells like old man cologne to me. That being said, the shampoo does work nicely. I didn't notice much lift or extra movement in my hair as a result of using this, but it got my hair very clean and did not weigh it down at all. Now that I have finished my bottle, I will be seeing what else is out there. This shampoo is super concentrated like all of their shampoos, but it's so creamy and rich that this didn't lather well on my hair. I left residue on my hair that was contradicting the volumizing claim, and I was so disappointed with this. Their purple, blue, and green bottled ones perform much better than this one. It also has the worst smell among these. It's very very expensive too, don't waste your money on this. really deep cleans without stripping...does add volume!